Worried about how your dog will react? Dogs actually like acupuncture. Most dogs fall asleep or become very relaxed once the needles are placed. Acupuncture is very effective for a wide range of canine ailments, but don't expect too much from a single treatment. Acupuncture in dogs (and humans) has a cumulative effect. The treatment is often used for pain and chronic disease, and movement disorders such as hip dysplasia, especially in older dogs. Acupuncture works through helping to maintain the health of the body. 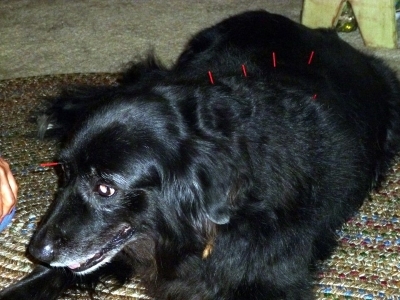 The basic principles of acupuncture are the same in animals as in humans. Chinese medical theory states that disease is the result of a blockage in energy flow (Qi or Chi) along pathways in the body. Inserting needles into these pathways unblocks the energy and restores health. I sometimes use magnets and lasers to enhance the effectiveness of the needles. 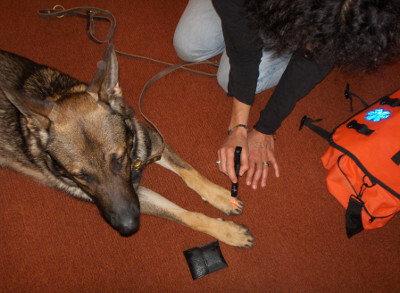 Though many people are a bit squeamish about needles, most dogs don't mind at all. Acupuncture in animals was first used on the horses of Chinese emperors over 2,000 years ago and has been widely used in the treatment of horses in America for decades. Nutrition and herbal therapy play a crucial role in canine health as well. An herbal and nutritional consultation is part of the initial treatment package. It's an opportunity for us to discuss your dog's diet and try to find ways that food is either hurting or helping the healing process. Laser therapy also known as laser acupuncture is a noninvasive procedure that uses light to stimulate cell regeneration, reduce inflammation and increase blood circulation. Acupressure is a Traditional Chinese Therapy used in at least 5,000 years ago. It began in ancient China where it was imperative to care for not only people, but their farm animals for survival. This form of massage was used on horses, cattle and other small animals. Traditional Chinese medicine works on the theory of promoting energy through the body. This energy is often referred to as "qi" or "chi". When the flow of qi becomes blocked, the body and mind may experience physical or emotional pain and illness. This form of massage is based on the acupuncture meridians and theory. 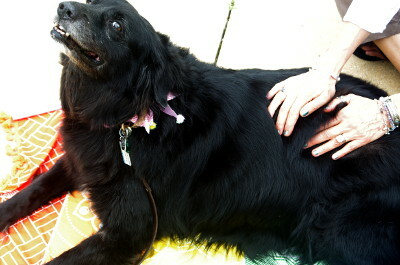 Reiki has been used on primarily on humans. Because it is a gentle and non-invasive therapy animals find it stress free. Reiki is said to heal on many levels of the patient's being, physical, mental and emotional. It is safe and is one of the few therapies that brings no harm to the recipient. During a Reiki session your animal does not need to be confined or restrained as it is a vibrational modality. Most animals will make it known where they prefer to be during the session. Moxabustion is the process of burning the herb Artemisia Vulgaris, a type of mugwort over specific acupuncture points and meridians. It is used to add warmth to an arthritic area made worse by cold. Tui Na is a Chinese system of massage and physical therapy. Employing the basic principles of acupuncture, combined with the modern knowledge of anatomy. Tui Na is used in China extensively for the treatment of injuries and is very effective on dogs. Chinese Herbal Liniments with medicinal properties which help relieve pain and inflammation are applied after the massage. Crystals have been used since ancient times for healing, medicinal purposes and spiritual practices as well as adornment. Gemstones and crystals are said to help heal emotions, calm the mind and reduce stress. In my holistic animal practice, I treat many rescued dogs and cats who have been abandoned, abused and traumatized. 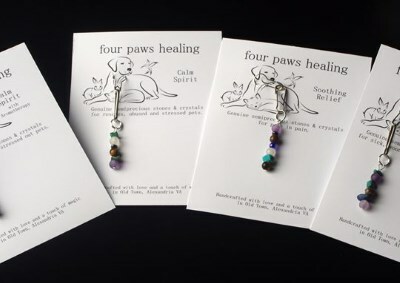 It is these dear beings who inspired me to create healing amulets for pets. The healing pet amulets may be attached to your pet’s collar, crate, cage or placed well hidden in its bed. Like many holistic treatments, gems have a subtle but powerful effect on your pet. Each crystal and gemstone are chosen for their healing properties to calm the mind, body and spirit. This is not a substitute for veterinary care or the other services I offer.